The second issue of the Newsletter is here. Please go through the newsletter & do share your valued inputs about it. 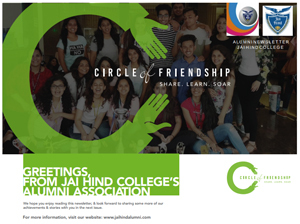 Request you to share interesting stories, articles, happenings, achievements, awards & news related to Alumni of Jai Hind College that can be published & circulated in our next issue due in May 2018. An earnest request to help us in this endeavor.